Junichiro Abe has been working as a seaman for 50 years. That’s right. 50 YEARS! I can only imagine his dedication and love for his work. Not everyone can do that. My father, too, has been a seaman for nearly 30 years (he was the reason I met Mr. Abe). He told me that his chief engineer, Mr. Abe, is friendly and easygoing. He was right. But not only friendly, also a man of inspiring stories. 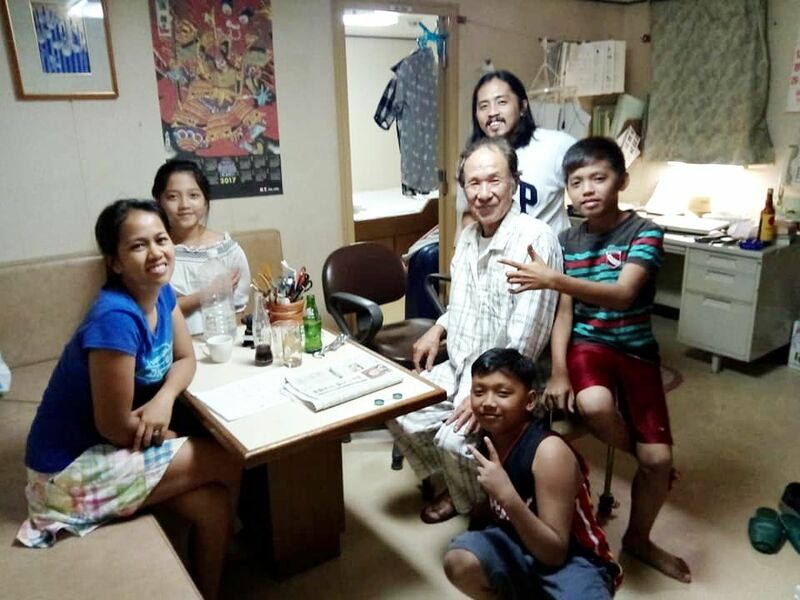 With over 50 years of experience working as a seaman, travelling, meeting different people, and engaging in different cultures, Mr. Abe truly knows a lot about human behavior and culture. 1. There’s no shortcut. Be patient. Approximately 50 years ago, he was just the ship’s utility worker. It’s a difficult job — we all know that — but still, a good start for him. That job was his training ground for developing patience and a strong work ethic. It helped build his foundation as a seaman. Years later, he studied marine engineering courses and soon took exams. Now he’s the chief engineer. It wasn’t planned. He just took chances. Lesson: Want to be a successful performing artist? There’s no shortcut. Want to be a great educator? There’s no shortcut. Want to be a successful entrepreneur? There’no shortcut. Every profession takes years of practice and discipline and sacrifice to reach mastery. You have to build your foundation and put together the pieces needed to become a better individual. It’s a long windy road. But it surely is rewarding. 2. Be Humble (Despite Your Success). It’s funny to think that some people I’ve met the first time brag how good they are at their work or how valuable they are to the company they work for. I applaud them. But I don’t admire those kind of people. Mr. Abe was the exact opposite. He didn’t brag his achievements. Instead, he talked about how good his workmates are. He admired my father’s work ethic and his crew’s unmatched hard work and dedication. He was so proud sharing stories of his team whom he believes are insanely workaholics. That is really an admirable trait of him. Lesson: Successful people don’t brag what they have or what they did. They let their actions and body of work speak their success. If you find yourself preaching about your expertise or your so-called successes, chances are, you’re not yet successful (whatever success means to you). You’re just bragging. Stop bragging. Do the work. 3. You Don’t Have to Master a Foreign Language to Communicate. I used to think that the only way to effectively communicate is through language fluency until Mr. Abe proved it wrong. FYI: He’s not English fluent and I had a hard time comprehending his stories the first few minutes of our conversation. We only started connecting when I focused more on his body language. It was magic. I was even more surprised when he drew diagrams while discussing his views on economic differences and learning curves between the Japanese and Filipinos (as well as other nationalities). Although I was the one who adjusted to eliminate language barrier, his initiative to use tools and other mediums to communicate was awe-inspiring. I didn’t expect that. Another important thing is that it forced me to be more attentive and present. That’s because I needed to understand whatever he’s trying to say, so I don’t misinterpret. It was challenging, at the same time, fun (yes, it was!). Maybe for others, mastering the language is a must. But let’s be honest, not everyone can master different languages. Some people don’t have time, or the privilege. This is not to disregard learning a new language. I believe Mr. Abe’s basic English laid the foundation of our communication. It would have been harder (maybe impossible) if Mr. Abe didn’t know the basics. Lesson: Don’t let language barrier stop you from making friends or connecting with like-minded individuals or talking with a stranger. If they can’t understand you, try a different medium. Maybe write or draw what you want to say. It’s no easy, but give it a try. (Of course, it would be easier if you know the basic of the language.) So, if you can, learn the basics. Same principle applies when pursuing dreams. Don’t let your inabilities hinder you. Use any little knowledge, skills, or resources you have. Use that a starting point. Great things happen to people who have the courage to try, despite the circumstances. Because, who knows?